Yesterday I finally manned up and popped the question to Stacey. This is the story of how I did it, and it goes all the way back to somewhere last year, at a time when we were looking forward to our dream holiday to New York and Florida. Somewhere along the line last year, the idea of proposing to Stacey in America came into my head. Unfortunately it was an idea that had occurred to plenty of other people too, as I can’t even think of a rough estimate of how many people asked me in the build up to that holiday ‘Are you going to propose in New York?’. To make matters worse, some people - my brothers included - thought they’d ask Stacey if she thought that we’d get engaged in The States. No, America was definitely out of the question. At the beginning of the year we got into watching How I Met Your Mother. It had been on TV in the evenings around the time Stacey got home from work. For those of you reading this that have never seen it, the show is an American sitcom set in the current day, but narrated by a future version of the lead character Ted, as he tells his kids the story of (you guessed it?) how he met their mother. Stacey bought the first few boxsets and we started watching the series from the beginning. Not too far in, there was an episode in which Ted wakes up hungover and lying next to a girl who’s unconscious and face-down. The whole episode is based around trying to figure out who he wound up with the night before, before the mystery girl wakes up. Although that’s the main plotline of that story, it’s the silly subplot of that episode that proved important to this story. Inspired, the following Friday night I stopped by Morrisons on the way home from work - or rather: post-work drinks - and picked up a pineapple, keeping it hidden when I got home. The next morning, Stacey awoke to a pineapple on her bedside table, and I awoke as she threw it in all its spikiness at my sleeping face! A running joke was born, as was ‘The Fruit Fairy’ because of course it wasn’t me that put the pineapple there. From then on, Stacey awoke every Saturday morning to a new piece of fruit: pineapples; coconuts; pink grapefruits; red grapefruits; white grapefruits; kiwis; apples; raisins (on a lazy week); strawberries; cherries; a tomato (another lazy week); oranges; pomegranate (a suggestion from our friend Becky that didn’t go down well); grapes; an onion squash; a pumpkin; melons; and several repeats of the above. I’m probably forgetting a few, but you get the point. One week The Fruit Fairy even brought a lime… along with a four-pack of San Miguels during the middle of the Summer. The Fruit Fairy took a couple of weeks off during our trip to America in April; something about not being able to cross the Atlantic. From there the seeds were sown (get it? seeds... fruit?) for an idea. I knew that if I were to ever pop the question, that Stacey would hate for it to be in a public place, and being the sleepaholic that she is - requiring anything between eight and fourteen hours of sleep a night - what better time and place could there be than when she awoke fully rested and warm and comfy in her favourite place in the world? Speaking of American sitcoms, ever see the episode of Friends where Chandler decides to let Monica think that he totally dead-set against marriage? If he’d kept that up for a year or two, he’d have been in my league. I’ve always known that one day I’d like to get married, and for years I’ve know to whom it would be… but she didn’t need to know that. I wanted it to be the surprise that it was. Over the course of the last couple of years, I’ve made sure to make it clear to Stacey and to anyone else when Stacey is nearby that I was completely anti the idea of getting married. We’d have people over for dinner who’d mention it and I would brush it off. In America when we met Tam, she said that she believed that a couple should get married if they had kids and I found an opportunity to have an argument about how the whole idea of a wedding and marriage was pointless and outdated… all for Stacey’s benefit. I was never obvious, but over the course of a long while I subtly etched the thought into Stacey’s mind that it was never going to be something that we’d do. While many of you reading this are probably thinking of me as some sort of genius, which I kind of am, this did all lead to a panic on my end a week before the question was asked. We were watching that new Karl Pilkington show and the first one was about marriage. Karl was going on about how he just didn’t get the idea behind it and that it was a pointless concept. I turned to Stacey and she was nodding in agreement, then turned to me and said: ‘I think I agree with him.’ which was not what I wanted to hear, knowing that an engagement ring was currently hidden in the depths of my bedside table. After everything had gone down yesterday, I asked Stacey about that, about how she had agreed with Karl Pilkington to which she replied that she was only saying all that stuff because that was how she thought I felt about it all. I had done a good job of it all, but almost too good of job. Although I had planned out how to do things with The Fruit Fairy and whatnot, I was quite happy to wait until I felt that the time was right. Well just over three weeks ago, on a Friday lunchtime I was wandering around and as I passed a jewellers near to my work, something caught my eye. It was a ring of white gold with a bright blue diamond that was surrounded by little sparkly bits. I stopped for a look, scanned the other rings in the window and knew in the back of my mind that that was it. The ring. I put off buying it for a few days, although I did pop into the jewellers to enquire and to take a closer look at the ring. I went back to the office that lunchtime and found Southern Bantamweight MMA Champion Paul Bentley alone on our desk, so I quickly asked him for his thoughts. The champion cage fighter helped to confirm for me that I should definitely go for it if it was what I wanted. I just needed to hear it from someone else as in my head it was all subjective and a little scary. Who better to get a pep-talk from than the champ? I asked Paul to keep it quiet and to not tell anyone in the office (even you Scotty. Sorry but you’re a bit of a gossip). Paul kept his promise although there was a funny moment the day after I bought the ring where I left my computer at work unlocked when I went to the loo, and when I came back Scott made a joke about sending an email to Stacey asking to her to get married. Later that day at hometime, Paul stopped to let me know that the whole thing was just a huge coincidence and that he hadn’t said a word to Scott. He then asked if I wanted him to come with me to buy the ring, as I had said that I might ask him to, but I had bought it the previous day at that point and when I told him, Paul became the first person to shake my hand and offer his congratulations. It was on the Thursday after I’d first seen the ring that I went out at lunchtime again to buy the ring. I peered into the windows of a couple of other jewellers on the way just to see what they had to offer, but nothing stood out. And really, I knew that this was the ring that Stacey would say yes to and would wear for the rest of her life. I had stolen one of her rings from home that morning, took it into the shop to compare sizes and bought the ring there and then, taking it home as there was only half a size difference in it. The jeweller agreed that it the ring was rather unique and little bit different. I was in the shop for no more than a few minutes and it just felt like any old transaction. On the walk back to the office though, I got the butterflies a bit. Last weekend was the eighth anniversary of when sixteen year old me first asked Stacey out. That seemed like a good day to do it, but I had tickets to go the the NFL match at Wembley with her dad and brother, so I didn’t much like the idea of asking the question then leaving her alone for the day. I knew that I wanted to do it on a Saturday so that we could then enjoy the whole weekend, but doing it last week wouldn’t have worked for two reasons: Firstly, last Saturday night we went to an engagement party for a couple of friends, Kim and Jason (congratulations to you two again, if you’re reading this). It would have been a bit weird for us to spend the evening we got engaged celebrating someone else’s engagement and that night was theirs. The other reason that I wanted to it off for a week was because I wanted to do the traditional thing of asking her dad first, and what better time or place could there be than on the eighth anniversary of the day I asked Stacey out, at Wembley Stadium as his team - the San Francisco 49ers - trounced the competition (or lack of), the Jacksonville Jaguars. Stacey’s brother went to the toilet or to get another beer, and I had an opening. It had seemed like such a simple thing to do, but I became suddenly nervous. I assumed that the if there had ever been any objection, that it would have come up at some point in the prior eight years. But still, I nearly bottled it. After a few minutes I did finally pluck up the courage and asked. It all went well and David was very happy, as was I. The 49ers went on to win 42-10. The week that followed was long. Really long and filled with wedding references. It was a struggle. And then I found out that the women in Stacey’s family were out for a meal on Saturday night and that her sister was staying with us from Thursday till Sunday. I thought about putting it off another week, but soon realised that it would be all the better as she would have her sister to go and tell right away, and would then be able to celebrate at their meal that evening. I had already arranged to meet up with Stacey after her meal that night as I made sure that a few of our friends would be going out. By complete coincidence, we met the mother in How I Met Your Mother during the week too, getting to the end of our boxsets. Some things you just can’t plan, and work out nicely like that. And so on Friday night I stopped off to pick up a pineapple on the way home from work, to round things out nicely. I wrote a note as The Fruit Fairy; ‘He has something to ask you...’ it said. 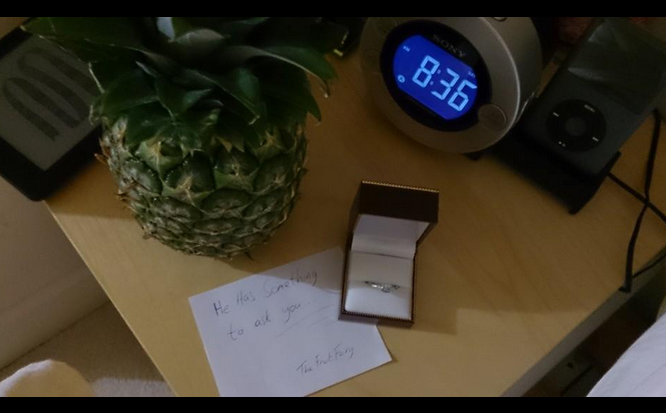 Then when Stacey was asleep I quietly retrieved the ring, the note and pineapple from my bedside table and crept around to Stacey’s side of the bed. I placed them all on her bedside table as she slept, facing towards it all. I then crept back and climbed into bed and thankfully was able to get to sleep easier than I thought I would thanks to the fact that I had had a lack of sleep the night before thanks to my parents - although I was annoyed at you two at the time, you really did me a bit of a favour after all. I slept through till five that morning, at which point I awoke in desperate need of the toilet, I lay there frozen for a few minutes, wondering whether it would be best to just try to go back to sleep instead of risking Stacey waking. A vision went through my mind of Stacey being woken by the sound of a flushing toilet and then finding the ring. Not exactly romantic. But I needed a wee so badly, worse than I’ve ever needed one before due to the fact that it became all I could think of. So I risked it and went. And she didn't wake up. And I got back into bed and had three hours of very broken, nervous sleep. It was at about eight in the morning that Stacey woke up, and as she shifted around, I too came to as I was sleeping very lightly by this point. She rolled over, gave me a cuddle while my heart pounded relentlessly, and then announced that she needed the loo as I had done a few hours before. This was going to be it, she’d see it now I was sure. She rolled over and climbed out bed. ‘Oh, a pineapple!’ she said as she walked off out of the room. She’d missed it! My heart nearly burst through my chest. I couldn't believe it and looked up to check that the ring and the note were still there. They were and she had just missed them, but I spotted that I had put the note down the wrong way up in the dark the night before, so that the writing was upside down as you looked down on it from the bed. I took the opportunity to flip the note and waited. Stacey came back in the room, climbed back into bed and asked, ‘So is this the end of The Fruit Fairy?’She knows; she did see it… I thought. ‘What do you mean?’ I asked back. ‘Look again.’ I told her and as she rolled over to have a look, I got up and out of bed, slowly making my way around the bed. She still missed the note, but she picked up the box and opened it up to see the ring. Meanwhile, as I was halfway round I told her to brace her as had a confession to make: ‘I am The Fruit Fairy!’ - Stacey played her part well and gave me a faux gasp. I made my way round to her side of the bed. ‘This is a nice present, thank you.’ said Stacey. I got down on one knee and took the ring from her hands. After a brief pause, I asked that fateful question that changes everything. She nodded, said ‘Yes!’ with a big smile on her pretty little face and practically jumped out of the bed onto me. We waited until late afternoon before allowing the twenty-first century to catch up to us by putting the news out on Facebook. Firstly we wanted to make sure we had the chance to tell all of our family and a few friends. We even had the diamond in the ring verified by a witch at Bodiam Castle. If it had proven the jewel to be fake, I threatened to jump out of the window into the moat. Despite all the excitement and all that came before it, this story is only just beginning. Stacey, I love you.